The first time I ever visited the Tokyo Disney Resort, I made it a point to stop by the Tokyo Disneyland Hotel. This grand, nine story Victorian-style hotel didn't open with the original resort, like Disney's other Victorian-style hotels in Hong Kong, Paris, and Florida did. Instead, it only opened less than ten years ago, in July of 2008. But it bears a special place in my heart, because as an intern during a summer break in college, I had the chance to work on the architectural design of this hotel. Granted, my role was quite limited, and the project was in Design Development stage back then--not even handed off to the local Japanese firm that would do the majority of construction documentation. But it was still a thrill to be able to work on a Disney project at a Disney resort that--even back then--I dreamed of visiting. Being able to do so a decade later was a most satisfying achievement! 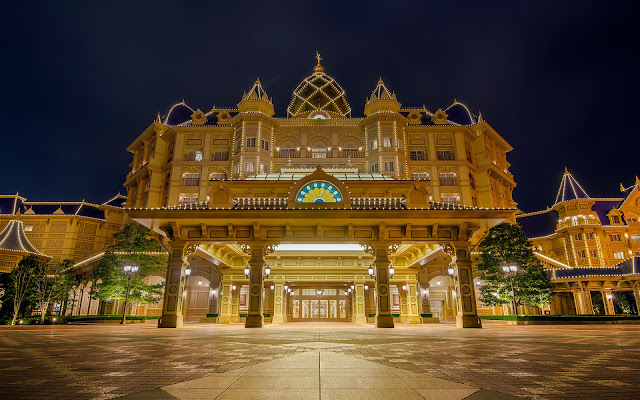 The empty porte cochere of the Tokyo Disneyland Hotel, late into the night.